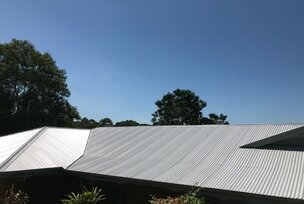 It is not often that we think about the life of our roof, here is why you probably should . . . 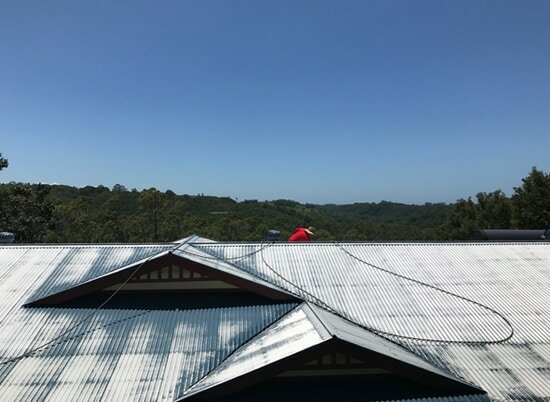 Roof Painting is a natural progression from roof cleaning, as there are many scenarios where a roof that has been cleaned, will require painting in the years that follow - this is particularly true for tiled roofs. 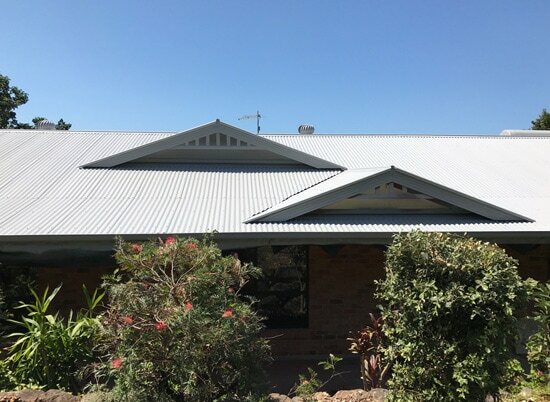 With a combined over 30 years of experience in coating roofs with the finest of Australian made specialist roof paints, Full Circle can offer a fair priced and quality roof restoration, including pointing, repairs and re-tiling using our close partner. 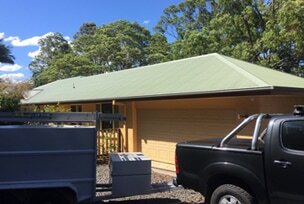 Experienced and qualified as a Painter and Roofer, we inspect, quote and complete all roof work together and your end result is often considered like having a new roof! We'll stand by our workmanship and paint for years to come. Do you even need to paint your roof? As you can see in the picture above, this green roof is actually in very good condition despite there being some conjecture as to whether it may have required painting or not. It can sometimes be difficult to gauge as to how well your roof is doing when it’s covered in foliage and mold, so it’s worth asking us if your roof requires painting at all. It’s a significant investment to paint and roof and there’s no point painting a perfectly good roof, when it may have many years of service left in it. 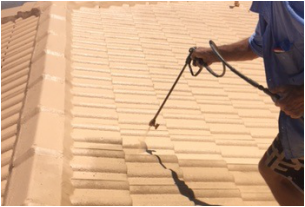 At Full Circle, we will be happy to clean your roof if that’s all that is required – without any undue pressure to paint and perhaps make a recommendation on when you should start to think about rejuvenating it. With tin and Colorbond surfaces being naturally very smooth they show-up all the imperfections of wear and tear and also newly applied paint if one is not careful. Not only are these surfaces more reflective of their treatment, they also require great paint preparation to ensure the best job possible. At Full Circle all tin roofs are sealed using CT primer by Suntuff, which seals the roof and provides an excellent texture for the paint to be applied to. 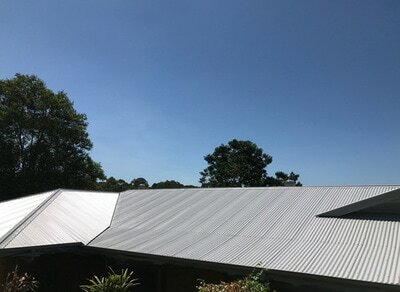 Without a roof painter using a dedicated sealant or primer on tin roofs, paint flaking down the track can be a risk to the home owner. At Full Circle we then apply two coats of colored paint which bonds incredibly well providing a fantastic look and durability for 10+ years. 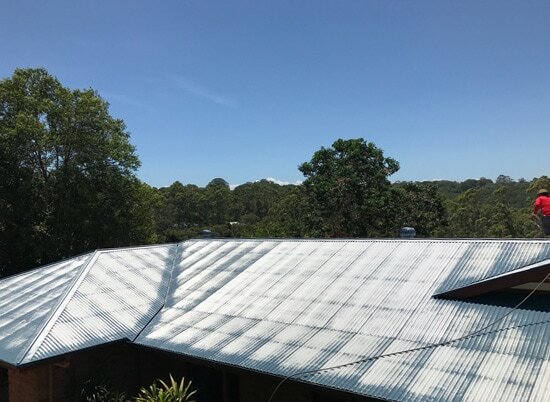 Whilst it’s obvious what happens if you don’t paint your roof (paint peels, fades, flakes or the tile and tin just degrades completely), it’s good to keep in mind a few practical factors when considering whether you do or don’t invest in your roof. 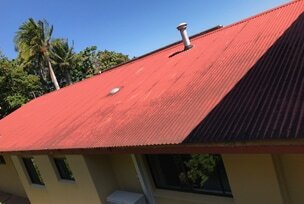 For example, often on tin roofs, screw heads start to rust first (especially near the sea). These rusting screw heads can be replaced and or if the rust is only mild, treated with converter – to avoid the rust spreading to tin panels which if left undetected will require full replacement. So too with tiled roofs, where pointing isn’t nipped in the bud, long term neglect can lead to much greater roof overhauls which become costly (not to mention risky to the home beneath the roof). Here we can see a roof that has been severely neglected; it’s roofing screws are in places beginning to rust quite considerably, paint has faded or gone powdery and even been stripped completely back to a bare surface after pressure cleaning. The process followed was to replace about 100 roofing screws, remove and replace quite a lot of silicone around inlets, exhaust pipes and where aerials etc were attached to the roof and then spray two thick coats of Gull Grey Sun Tuff Paint. All in all, this was a complete turn-around before more costly deterioration could set-in.